This was taken a week after my birthday. We had a get together with my whole barkada's since two among us celebrated our special day for the LOVE month. An overloaded pizza that made us stay at the food chain for 2 hours of eating and chatting. 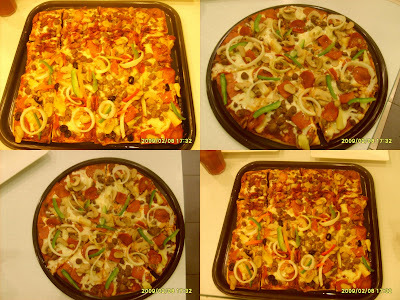 i am sooo drooling to the max just looking at those pizzas! O wow! That looks absolutely wonderful! wow kalami sad ani Mommy Phebs...food trip man diay mo dha...hehehe! I miss those days!